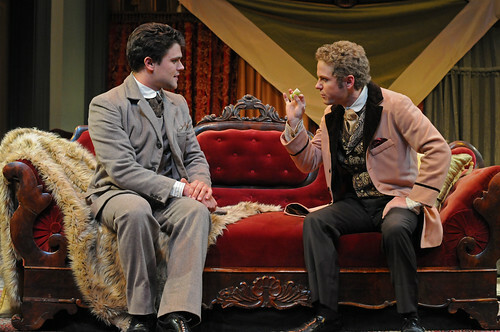 Stanford undergrads Austin Caldwell as Algernon (right) and David Raymond as Jack are part of director Lynne Soffer’s crack cast in Stanford Summer Theater’s production of The Importance of Being Earnest by Oscar Wilde. Below: Courtney Walsh steals the show as Lady Bracknell. Photos courtesy of Stanford Summer Theater. 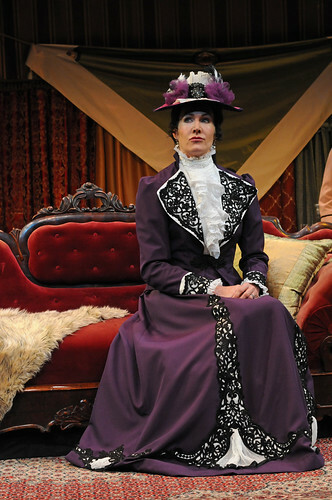 How nice to report that Stanford Summer Theater launches its 15th anniversary season with a crackling good production of Oscar Wilde’s masterwork, The Importance of Being Earnest directed by Lynne Soffer. I reviewed the show for the Palo Alto Weekly. Here are a few excerpts. Perhaps Soffer’s great accomplishment here is casting actors with mostly crackling good chemistry. Of course there are the two central romantic couples, but where the chemistry really energizes the play is between friends Algernon and Jack and rivals/besties Gwendolen and Cecily. Jack: You don’t think there is any chance of Gwendolen becoming like her mother in about 150 years, do you, Algy? Algernon: All women become like their mothers. That is their tragedy. No man does. That’s his. It’s a perfect set-up and delivery, but then Wilde takes it one level further, as Jack becomes an even more perfect straight man, positioning Algernon for the proverbial slam dunk. Algernon: It is perfectly phrased! And quite as true as any observation in civilized life should be. Played by Courtney Walsh, this Lady Bracknell is a tower — literally, as this is a tall actor made taller by costumer Connie Strayer’s divine hats — of societal propriety. With her booming voice and ever-arching eyebrows, she is not only a scene stealer but also a play stealer, and all without chewing the scenery as some Lady Bracknells are prone to do. You could forgive her for taking bites of the scenery because the designs by Erik Flatmo are, in a word, delicious. “Earnest” is very much a period piece (which is why TheatreWorks’ updating of it to the ’60s fizzled), and Flatmo goes all out to create sumptuous settings for Algernon’s London townhouse, drowning in rich fabrics and bachelor excess, and the light, airy gardens and manor house of Jack’s Hertfordshire estate (the lovely lighting is by Michael Ramsaur). Stanford Summer Theater’s “The Importance of Being Earnest” by Oscar Wilde continues through Aug. 11 at the Pigott Theater, Memorial Auditorium, 551 Serra Mall, Stanford. Tickets are $15-$25. Call 650-725-5838 or visit sst.stanford.edu.